BBC News - How are homeless people coping in frozen Britain? How are homeless people coping in frozen Britain? With Britain still in the grip of a big freeze, homeless charities are warning of "life-threatening" conditions and are taking extra measures to get people off the streets. At St Mungo's emergency shelter in London's Battersea Park Road, an empty office block turned into temporary accommodation is almost full of rough sleepers. 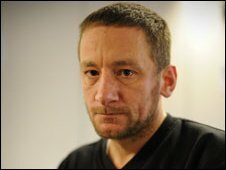 Andy Frost, who has been sleeping rough for three years - after "family problems and a relationship breakdown in Nottingham" - turned to the shelter "out of desperation". "Normally the weather doesn't bother me - but the snow and ice has been really cold - I could feel my fingers, but nothing else," he said. The 37-year-old, who has worked as a forklift driver, carpet fitter and painter and decorator in the past, said he was sleeping in Lambeth Park with seven others when an outreach team from St Mungo's - London's largest homeless charity - found him. "Only two of us came in - I don't know why the others didn't, but you can't force people," he said. Mr Frost said the shelter had been "great" and he hoped to come back as a volunteer next year. "I've got 10 months to get sorted, to get work. I want to go on a Church detox. I've not drunk for two days now and I'm ok - normally I'd be sweating and shaking after one day," he said. A 26-year-old man, from Latvia, who would not give his name, said he turned to the shelter because he was "really cold and tired" and wanted "to get warm". He said: "I used to work in a coffee shop in Tower Hamlets and live in a shared house in East Croydon, but I lost my job. As I hadn't worked for a year, I couldn't claim benefits. I ended up on the streets. 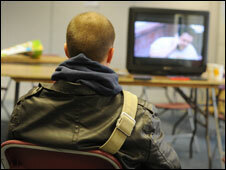 A 26-year-old from Latvia turned to the shelter "to get warm"
"I have a drinking problem. It is very quick to fall down, and the system makes it very difficult to get back. I have no money, no phone, no address - you need that to get a job. I am stuck in this situation - the only thing to do is drink," he said. Eva Studzinska, manager of the emergency centre, said the shelter - which is funded by the Department of Communities and Local Government (CLG) had put up about 90 people since it opened on 7 January. Ms Studzinska said about 70% of the rough sleepers in the shelter on Battersea Park Road were foreign nationals. "Some are eligible for benefits, but they don't know how to access them. Lots have lost jobs - the construction industry has fallen though the floor - some have mental health issues," she said. She said the emergency shelter - which provides mattresses, blankets, hot food, showers and clean clothes - had been "vital" because of the "threat" of the cold weather. 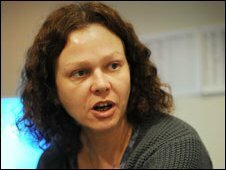 Eva Studzinska said the emergency shelter was "vital"
"People die on the streets - they could literally freeze to death. Some become very low and suicidal when it is freezing cold. "We are trying to reach the people who are hard to reach," she said. But Ms Studzinska said the services were "fairly basic and rudimentary" and it was important to get people to register with GPs, get back on medication and find more permanent accommodation. A spokesman for the charity Crisis, which is helping St Mungo's with its emergency shelter, said the "prolonged" weather was "unprecedented" and "death was a real possibility" for the homeless. The charity said it wanted the government to reinforce to local authorities "their duty" to take in rough sleepers when the temperature dropped below 0 degrees for three consecutive nights. CLG figures put the number of people sleeping rough during any one night in London to be about 250, with about 3,500 homeless people in the city over the year. 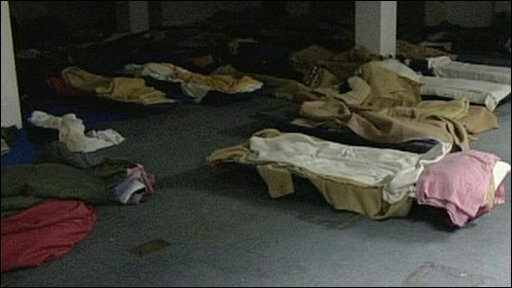 Crisis said 2,000 guests had stayed in its nine temporary centres which opened in London for a week over Christmas. The centres provided hot meals and shelter, housing services, job advice, health checks, training and further education opportunities. The Refugee Council's day centre in Brixton, London, said seven times as many people had received service support from 21 December 2009 to 8 January 2010 than during the same period last year. "People have had problems with heating and warm clothes. Shoes are a perennial problem and we have been giving out more hats, gloves and scarves. We have also supplied baby packs for new mothers and food parcels," said Zoe Burton, the day centre co-ordinator. Asmeret Chefena, 26, from Eritrea, said the centre's free hot meals - served to about 120 people every day - were "very important" to her. "It's very cold sleeping outside, I've been on the streets for two months. My asylum application has been refused, but I can't go back to Eritrea because my religion is Pentecost and I will get arrested. I have already spent two months in prison in my country," she said. The Red Cross said its Birmingham centre - which usually operates twice a week - had been opening Monday to Friday and distributing hot soup and food as well as items like sleeping bags and blankets. Foil thermal blankets had also been distributed to destitute and homeless refugees and asylum seekers in Peterborough. The Scottish Government has also advised councils on emergency arrangements. The London Delivery Board - which was set up by the Mayor and brings together central government, London's boroughs and voluntary sector providers - hopes to end rough sleeping in London by 2012.